It's Matt standing in for Steve for Friday's Race of the Day, and we're staying on the all weather for a mile and a quarter Class 5 handicap at Newcastle. 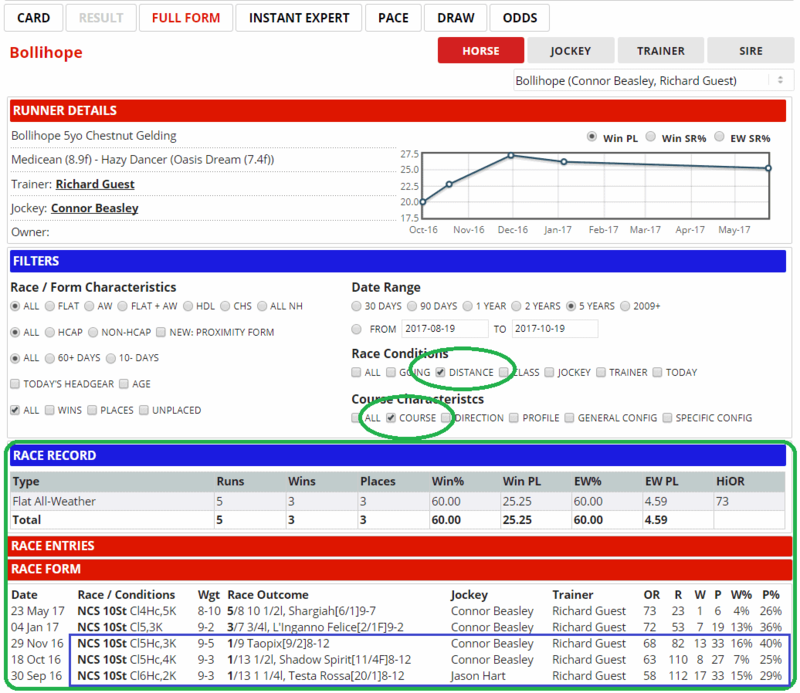 Friday's Feature of the Day - free to all registered users - is the Horses For Courses report, and top of the tree on there with a 50% win record is Richard Guest's Bollihope. 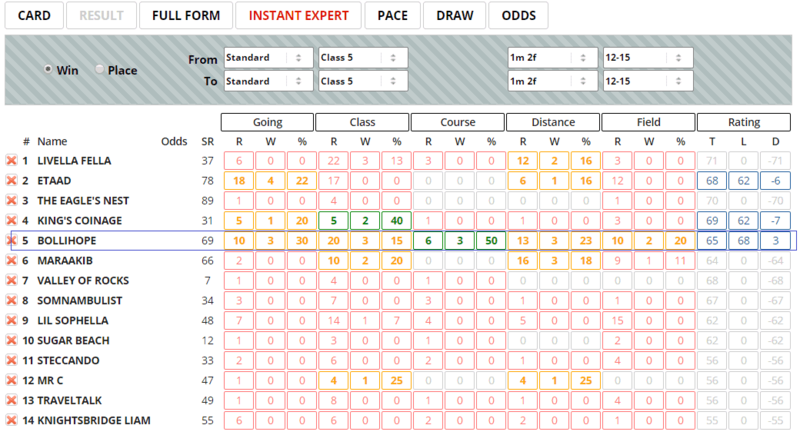 Using Full Form, with course and distance boxes selected, we can see his three wins have all come over today's trip, and in this grade or lower. We can also see from the above that Bollihope has been racing recently off higher marks (OR column) - in the 70's - than when he was winning. 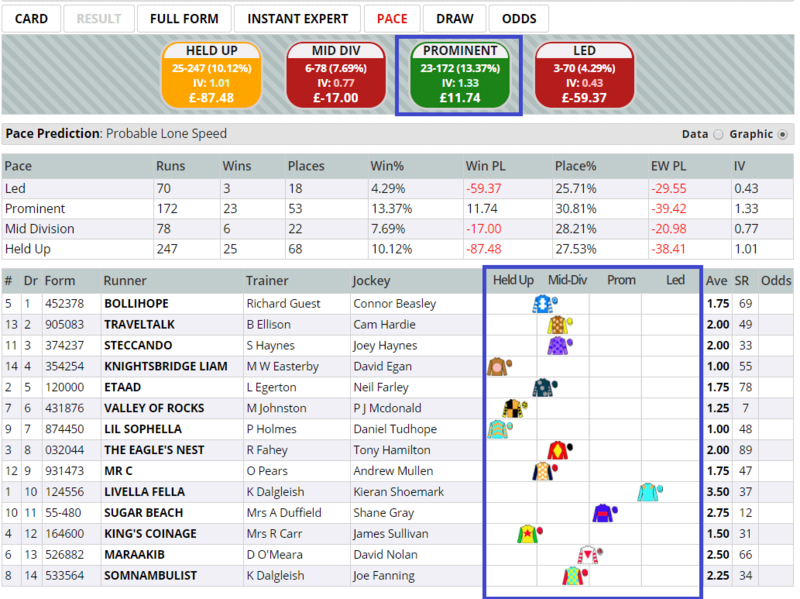 Today, as the right hand columns indicate on Instant Expert, he's back to a mark from which he should be competitive, three pounds below that last winning rating of 68. His line of green and amber contrasts with the sea of red from his rivals. This means that he is better proven against today's race conditions, although of course any horse - especially one of the more lightly raced types - could step forward. Flicking back to Full Form and viewing all form, we can see that Bollihope is a good bit better on the all weather than turf, though he did win on grass back in 2015 (when trained by John Gosden). It may be interesting then that he returns to the 'sand' after six turf runs which have moved his mark down from 73 to today's 65. Bollihope is drawn in stall one and should be able to track the pace, likely made by Livella Fella, as seen below on our Pace tab, sorted by draw. There is a probably lone speed, and though Connor Beasley's mount is general a mid-division runner, the shape of this race - inside draw and very little pace elsewhere - means he'll probably be prominent, a perfect fit historically as can be seen by the green pace 'blob'. Off what looks like a regressive series of runs, Bollihope figures to be a fair price at around 6/1 but we can see from the above that he returns to a course, distance and grade which suit him very well. Click here for the 17:40 at Newcastle.